Looking For Your Next Rehab Project? Looking For Your Next Turnkey Cashflowing Rental? in their own market.Our team will do all of the work, while you receive the monthly rental check with as little in volvement as you desire. Complete this form to be added to our "Hot List" and get immediate access to your FREE copy of our new report, "Insider Deals - A Guide to Finding Real Estate Deals Before They Hit the Open Market." We have a massive network of motivated sellers who are ready to sell quickly at rock bottom prices. By joining our "Hot List" you will have access to our extensive list of rehab properties before anyone else, even local real estate agents! 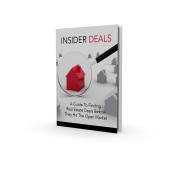 You'll also immediately receive your Free copy of the brand new report "Insider Deals - A Guide to Finding Real Estate Deals Before They Hit the Open Market."